Taking a cab in Liverpool is much simpler for blind and partially sighted people, thanks to a training scheme aimed at taxi drivers. Radhika Holmström reports. “For 20 years, I’ve been carrying people around. I thought I was doing the right thing for a blind person who took my cab – I’d open the door. Boy, was I wrong,” says Steve Crawley. Crawley was one of the first taxi drivers to do the two-hour training and awareness sessions run by Christopher Grange Visual Rehabilitation Centre in Liverpool. Since then, more than 1,200 people have taken the same course, which means that taxi travel for the nine thousand blind and partially sighted people in Merseyside has radically improved. The centre was set up in 1972 and provides day services to blind and partially sighted people. It also offers training to medical students and police officers in the issues they should think about in dealing with blind and partially sighted people. “We make a positive difference to people’s lives,” says Mike Bailey, the centre’s service director. The emphasis is on support, skills training and independent living: and the taxi driver training is very much part of this. “One thing I tell people is that a bad experience with a taxi driver can mean someone ends up not going out at all, because their confidence has been so knocked back,” Bailey says. Conversely, a decent transport system means that people have a lot more freedom and control over their lives and activities. Bailey actually started his life at the centre as a service user himself – and at the time, like many people losing their sight, he was finding life quite tough. One of his peers (Tony) was particularly encouraging; and in fact it was this man whom Bailey saw, two years ago, waiting for a taxi to take him home from the centre. “He was standing outside our main building. We had a chat, I said I’d see him in a couple of days, and I went into my office. I heard the taxi draw up, and took a look out – the driver was sitting there, making no effort at all to attract his attention. Bailey had struck lucky: for one thing the company, Delta Taxis, claims it is the biggest private taxi company in Europe (it now has more than 2,000 drivers) and for another, the manager he spoke to was keen not only to talk to him, but invited him to meet with the Chief Executive. “I thought… oh no, what have I done?” Bailey admits cheerfully. The first step was to get the views of the service users on their experiences of using that particular taxi service. Some of the feedback was positive (drivers who knew to knock on the door or give people directions). But other comments included refusals to take guide dogs, refusals to help blind people in and out of the taxi, or walk them to the door (including claims that this went against health and safety or insurance regulations) and drivers who did want to help, but tended to pull rather than guide. “We met and told them what we could do. And they could see the potential – not just for the service users themselves, but their families too.” The number of possible customers – loyal ones who would return time after time – was one pragmatic reason for taking this on. The result was a two-hour training programme for 12 drivers (costing £20 per driver). Like training courses already on offer for medical students and police officers, this is bespoke training – not just in general awareness, but in the specific things that taxi drivers need to think about and do. In those two hours, they learn a bit about blindness and eye conditions: then they are blindfolded and introduced to a “mystery guest” (one of the service users). After that, blindfolded, they are asked to make themselves drinks, using liquid level indicators, and one by one are taken out to “get their cab”, with the “helpful” information that “it’s a red one”. They are taken out to two cabs – if there’s time, they’ll be told they’ve got in the wrong car – and have to deal with the driver, and handling a wallet of money. Once the drivers have experienced a little of what it’s like for the people they drive, they’re told to remove their blindfolds and shown how to handle their customers properly. “First introduce themselves, and ask if the passenger needs assistance. Just talk normally, like you would to any passenger. We show them how to guide someone through a door and tell them about the guide dogs (including the fact they should never refuse one). They’re so confident when they go,” says Bailey. Then, finally, they meet their “mystery guest” – and realise that the person they had imagined is in fact someone completely different. From there, the course has gone from strength to strength. 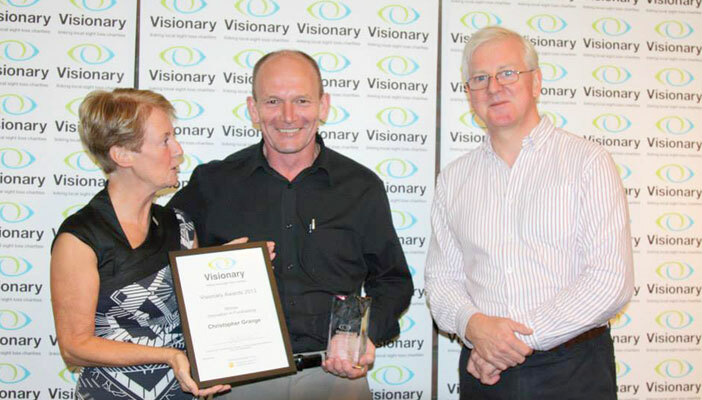 Last year (2013), it won an award from Visionary, the membership organisation for local independent charities that support blind and partially sighted people across the UK. The centre is offering training to other taxi companies too – with a great deal of backing from the local council – and the course has been accredited by the organisation Open Awards. It is not just about the driving experience, Bailey points out: and a lot of the emphasis isn’t so much on “getting things right” as overcoming the awkwardness that a lot of non-disabled people feel when they are faced with disability. “From seeing taxi drivers arrive not really wanting to be on a training course, to seeing them leaving thanking us and shaking our hands, has brought tears to my eyes: we’ve made a difference for the better,” says Crawley.